Posted in Paradigms, Who are they? Entity: Thank you, dear sister. When I was nearly four decades and I separated from Mileva and Elsa attracted me, with her I felt like a kind of internal communication. And somehow, it's like that she supported me a lot in what I was doing. 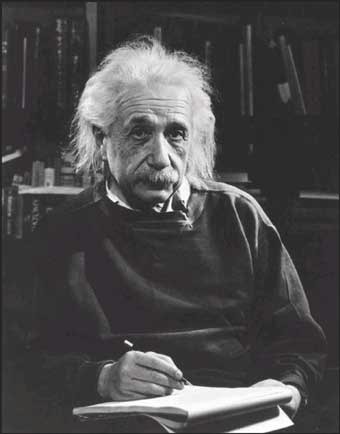 I was working in a simple office in Bern and I was doing the calculations of the theory of special relativity. I was interested on the electromagnetic field. Then, when I developed the theory of general relativity, I did research on space-time. Interlocutor: I would like to let you know that, apart from admiring your work as a physicist, I like a lot and I identify very much with your thoughts. I would like to ask you if after that incarnation you have reincarnated. Interlocutor: And from the plane where you are, Do you have contact with other thetans? Do you contact embodied beings as well? Entity: Yes, of course, I contact with thetans from embodied beings, I guide the 10% incarnated and I have contacts with Spirits of Light to exchange concepts. Notice that there are many Masters, some of them incarnated and others are disembodied spirits, who give preference by saying that gravity is not a force but a curvature. If you take the time to read what I've written, what I have left at that time -and we're talking about almost seven decades ago or more- I was speaking about the curvature of space-time, where a mass produced a curvature. Notice that even the light -and I developed that- was bent in a space and astronomers and physicists of that time did not know how to interpret that. Then, when I developed mathematical formulas, showing that the mass of a body could bend space in such a way that even the light itself was curved. And it was more than half a century before the current Masters brought to light. Interlocutor: In your last years, as Albert, you've been quite busy studying how to integrate a theory of a gravitational force and electromagnetic force, Is there any other concept or contribution that you can share with us, now that you are disembodied? Entity: Sure. My mistake in that incarnation is that I accept that when one has something in front of one’s eyes and one is so concentrated on something, one does not see the obvious thing. Well, if I myself, in that incarnation as Albert, commented -developing mathematical formulas- that gravity was a curvature produced by a mass, it was impossible to unify it with electromagnetism because, although the strong force and the weak force are considered forces. Even years before I developed my theory, electricity and magnetism were considered separate forces, which later on were merged into one force called electromagnetism. When I was looking for the theory of everything, l wanted to unify mathematically gravity with the other forces but, why I have not been able to achieve it? Because I didn’t pay attention to something which was very obvious that it was in front of me. That gravity was not a force. Interlocutor: What’s your opinion on the undivided mind? Interlocutor: We’ll call it “holographic” using quotation marks. Entity: Yes, and then, it’s like you can connect with the Everything and, surely, two or more people can -and they have- reached the same conclusion either in this world or in other worlds, regardless the type of civilization. However beware: It’s not that you, because you have been connected directly to that 'undivided mind', reach a conclusion because, as Albert, I had to have not only a base, but a gigantic castle of knowledge. Interlocutor: Let’s say that the undivided mind allows you to have an inspiration, grasping a concept, an idea, and after having the tools of knowledge, you can develop it. Entity: Sure, if you don’t have a castle of knowledge, there is no undivided mind whatsoever. And there are many opportunistic beings -how difficult it is to bring a concept to spoken language- that are interested in winning the medal without having run the hundred meters, if you understand. These opportunistic beings seek, somehow, to achieve the result without having the sacrifice of the study. When the Master Johnakan talks about how important is the service and not the sacrifice, I’m talking about another kind of sacrifice: the hard work, studying, burning the midnight oil, while the next day you had to work at an office. In seeing how little they considered me when I was young, many teachers thought: "this young man, Einstein, I see no great future for him", Do you understand? But if you don’t’ have the base of study, if you don’t have the knowledge, if you don’t’ have the commitment, it’s impossible that you grasp that undivided mind and turn it into a practical result. Interlocutor: Another question: It’s said that we can, from a particle, a small part of matter, have a huge source of energy. Entity: Right. And I have proved that. Interlocutor: In fact, on these studies is based the knowledge that have made the atomic bomb. Entity: I have a little knowledge of that! Entity: I think that everyone knows the formula! Interlocutor: It is also said that in order to create matter it is necessary a huge amount of energy. Is there something, some knowledge or tool that is escaping from today's scientists to do that? Interlocutor: Are you speaking about quarks? Interlocutor: Are there even smaller particles than those? Interlocutor: Could you tell us about it? Entity: Yes, the Higgs field –and we are talking about atomic and subatomic level- it’s a field completely independent from any other field, it’s a field that makes that quarks weigh more, it’s as if that field had a kind of gravitational force. I'm talking about it in a very basic language, just to be understood. Interlocutor: How would you call that force? This has not yet been named. Entity: Higgs field. Then, if for quantum physicists –let’s talk about size- if the size of a quark can be similar to the size of an electron why certain quarks weigh thousands of times more? Because the spinning electron around the atomic orbit is far from the Higgs field, then it is lighter. I explain it in a simplest way possible. Inside this Higgs field there is a sort of densification that makes that that ‘up quark’ be thousands of times 'heavier' or that it has more mass than the electron, however, it’s an indivisible particle. That is what I wanted to comment. Interlocutor: It’s a stunning contribution and I thank you so much for your comment. With respect to the dark energy, Could you tell us something else? Entity: It is an energy that it will take some time for scientists to explain it. Interlocutor: Is there any relationship between this energy and the Higgs field? Entity: Not at all. That energy is a repellent energy, it’s a great repeller. Interlocutor: And what is the reason? Entity: It's in its nature to be a great repeller; in the same way that gravity is in its nature that the mass deforms the space causing the gravitational field. This repellent factor is currently responsible for the accelerated expansion of the universe. Reaching a certain extension that repeller -and this has not been said before, take it as a paradigm – it will be weakening and a great contractor will be strengthened, which is the dark matter. When there is a balance between the repeller and the contractor the universe will stop expanding rapidly and it will start with a slight contraction. When that contractor force called dark matter starts, there will be an accelerated contraction –just like now there is an accelerated expansion- until the Big Crunch comes and everything becomes a tremendous singularity. Like those who study the superphysical world would say: our Creator would stop being manifested until the next manifestation. Interlocutor: How long does it take, approximately, from a Big Bang to a big Crunch? Entity: You can calculate forty billion years (40,000,000,000). So, we still have (13.7 billion years) of antiquity in this Creation. There is still time to expand. Interlocutor: The thing is that the human being, watch out his planet and start respecting each other, right? Entity: Yes, Notice that this planet has barely four and a half billion years (4.5 billion) compared to 13.7 billion years (13,700,000,000) of this universe. I'll let this beautiful and blessed vessel rest and don’t miss the chance to contact me again. Interlocutor: I’d love to do it and don’t doubt that I'll contact you again. I have many personal questions for you. I'd like to ask you in a future session about your political viewpoints and the conditioning they had on your research. Interlocutor: I don’t want to imagine what you felt about everything, and what you went through just by the way the man used that knowledge. Entity: That’s Right. For that reason our Father says: we are a huge kindergarten - I include myself-. Interlocutor: See you soon. All the Light to you. Ertel-El: Sometimes it's like you all have a lack of information about astronomical phenomena. The so-called black holes are not holes; they are celestial objects with a very high gravity. In order to give you an idea, a supergiant star, like Antares, at some point will exhaust its nuclear fuel, the star will reach a turnoff point and it can condense more and more to the point that electrons and protons are no longer there; leaving only neutron cores and it becomes a neutron star. If several bodies, such as that neutron star, attract each other they form a solid body so compressed that something of the size of a marble could weigh a ton, ten tons, one hundred tons. Its gravity is so huge; its spatial curvature is so huge that not even light can escape from its event horizon. It's not true what some astrophysicists say that through a black hole, using it as a bridge, one can go to another place in the universe. A black hole is not a passage or a bridge, it’s a solid object, so heavy, so compressed that if it only had the size of a ball; it could have as much mass as a planetoid. And there are so gigantic black holes that they can even swallow up stars. The word swallow or engulf it’s not used correctly, actually it’s like they are joined together, they are added to its gravitational well. And not only is there a black hole in the center of each galaxy, but there are even many undetected black holes between galactic spaces. The so-called white holes do not exist either, which are the passages out of which alleged starships would cross that bridge. What astrophysicists or astronomers have not yet detected are those pleats or membranes, which are passages that do allow traveling many light years away, and in the future these membranes can be detected by quantum computers, computers that are used by the ships of advanced civilizations. Civilizations that seek their own welfare and the welfare of other civilizations and their inhabitants, and they are surprised to see how the inhabitants in Sun 3, watching that little blue planet as you call it, is mistreated by its inhabitants, who allegedly are smarter, but they fight over something that they will not be able to take beyond the physical life. There is so much stupidity, so much. It is easier to escape from the intense gravity of a black hole than to take a material possession to the superphysical plane. Thank you for allowing me this moment of reflection. This entry was posted at Wednesday, September 26, 2012 and is filed under Paradigms, Who are they? . You can follow any responses to this entry through the .